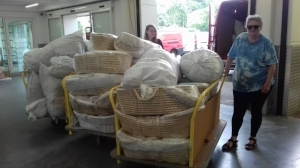 From your house, community, place of worship, your club, your garage....your wonderful Moses Baskets and donations of clothes on Thursday 28th June started on their long journey to Syria! That's 25 Moses Baskets and 60 sacks full of sorted clothing joining a container of aid to Syria hopefully next weekend. We really can't thank you all enough! !